Exercise for back pain isn’t just about getting into Lycra shorts and going to the gym – everyday tasks around the house can be turned into exercise that helps to improve back pain, and strengthens muscles to prevent it happening again, as well as burning a few additional calories as an added extra. Pick up dirty laundry from the floor, one piece at a time, by squatting with a straight back and keeping heels on the floor – this is good for leg, buttock and thigh muscles and will help with balance and stretch the back. Laundry throwing may be easier with a top-loading machine than a front-loading machine, but either way will improve aim as well as stretching and strengthening stomach, hip and lower back muscles. Stand as far as possible away from the washing machine, next to the dirty washing basket (with the machine on the right and the washing basket in the left at about waist height. Keeping feet still, twist from the hips to the left to pick washing up and twist to the right to throw it into the machine. Once the washing is clean, do this again with the wet washing, picking it from the machine and throwing it to the basket a few metres away. Rather than having the laundry basket on a table when ironing, put it down on the floor, and bend to get each item, then stretch. Make the most of emptying the dishwasher – twist from the hips when reaching down to take crockery, cutlery and glassware out, and reach up and stretch to put things away on high shelves. When sweeping the floor, reach out forwards with the broom as far as possible, and then sweep in slow, long smooth strokes towards the body, turning at the hips and sweeping on both the right and the left side. This will also work for mopping and scrubbing the kitchen floor. Do the same with the vacuum cleaner – as this is heavier, it will add more resistance (changing the brush setting can also increase the resistance). This is good for upper back, leg and buttock muscles. Cleaning high windows and tops of doors, dusting high shelves or whisking away cobwebs on the ceiling will stretch out the back, neck and shoulders – reach up as high as possible for the best stretch. When standing to iron, cook or wash up, tighten up stomach muscles, hold for as long as possible and then relax them, and repeat. This will strengthen the core muscles, which support the back. Stand with stomach muscles tightened up, and slowly lift two shopping bags until arms are parallel with the floor, hold, and lower back slowly down. This is good for the stomach muscles, arm muscles, and the upper back. 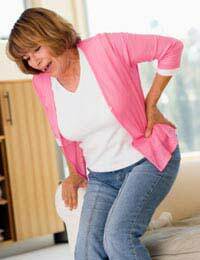 Gardening, including mowing and weeding, will stretch and strengthen back and leg muscles – but don’t overdo the digging, as this can cause or worsen back pain. Cleaning out gutters involves lots of reaching and back stretches.